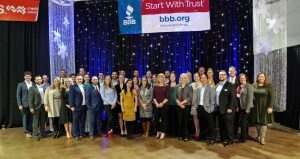 LOVELAND — Forty up-and-coming leaders in the Northern Colorado business community were honored at BizWest’s 40 Under Forty awards ceremony last night at the Ranch in Loveland. The event was attended by about 325 people. Recipients of this year’s award — nominated by their companies, coworkers or friends and selected by a panel of previous winners — are listed here. Their companies or employers follow their names. Amy Alcorn, Aspen Grove Marketing. Kyla Antony, Front Range Community College. Mara Brosy-Wiwchar, U.S. Rep. Jared Polis’ office. Clinton Dale, Columbine Health Systems. Karla Del Carpio-Ovando, University of Northern Colorado. Michael Durkin, Poudre Fire Authority. Christopher Elder, Elder Construction Inc.
Patrick Elder, Elder Construction Inc.
Mark Ferguson, Blue Steel Real Estate. Nick Galluzo, LC Real Estate Group. Cristóbal Garcia, city of Greeley. Mallory Griffith, The Pendley Project and Mallory Griffith SLP LLC. Erik Hegstad, Brock and Co. CPAs P.C. Emily Jolly Birdsall, Jolly Events. Nick Kenny, Greeley Philharmonic Orchestra. Desiree Landt, A Better Day Cleaning & Concierge. Brian McKinnon, Northern Colorado Realty Inc.
Caroline Mitchell, city of Fort Collins. Shelley Polansky, Better Business Bureau Serving Northern Colorado and Wyoming. Jenna Riedi, Canyon Concert Ballet. Philip Rodriguez, city of Brighton. Amanda Sammartino, United Way of Larimer County. Katie Shilts, UCHealth Medical Group. Travis Storin, city of Fort Collins. Grant Stump, United Way of Larimer County. Sarah Swanty, Fort Collins Cat Rescue & Spay/Neuter Clinic. Lisa Taylor, Immigrant & Refugee Center of Northern Colorado. James Yearling, Downtown Fort Collins Business Association.